"So Momma, what's the assignment for today's shoot?" "Of course they're pillows, silly Momma. But what's the assignment?" 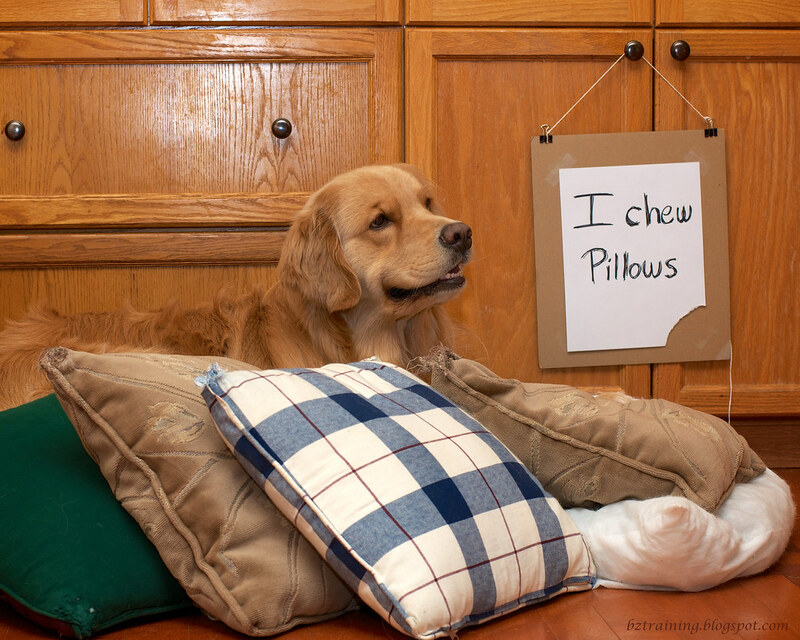 Do you recognize those pillows, Henry? 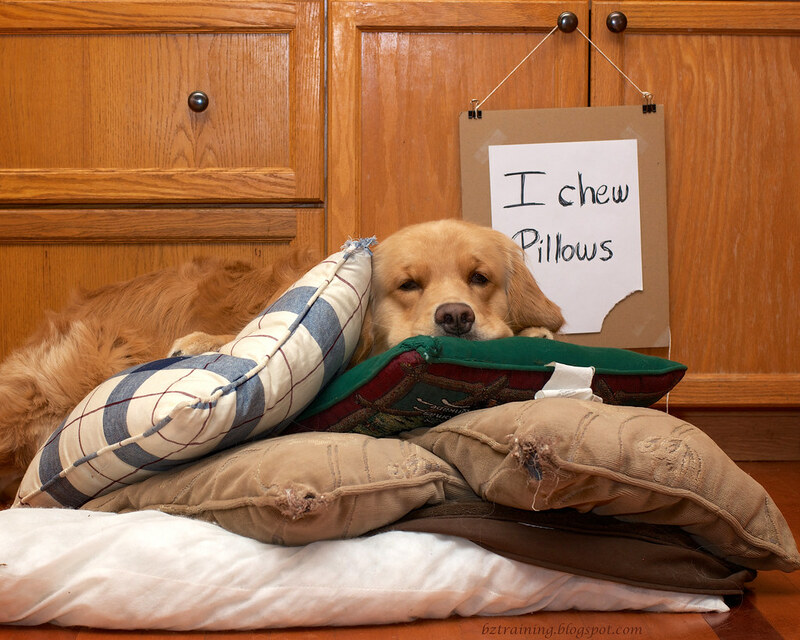 "I like the comfy pillows." Funny, how they don't get to lay on the sofa any more. Could it be because someone ate the corners off? Daily Dog Challenge "317. "Dog Shaming or Faming"
Our Daily Challenge - Sep 12, 2012 - "Door"
… for all to see. 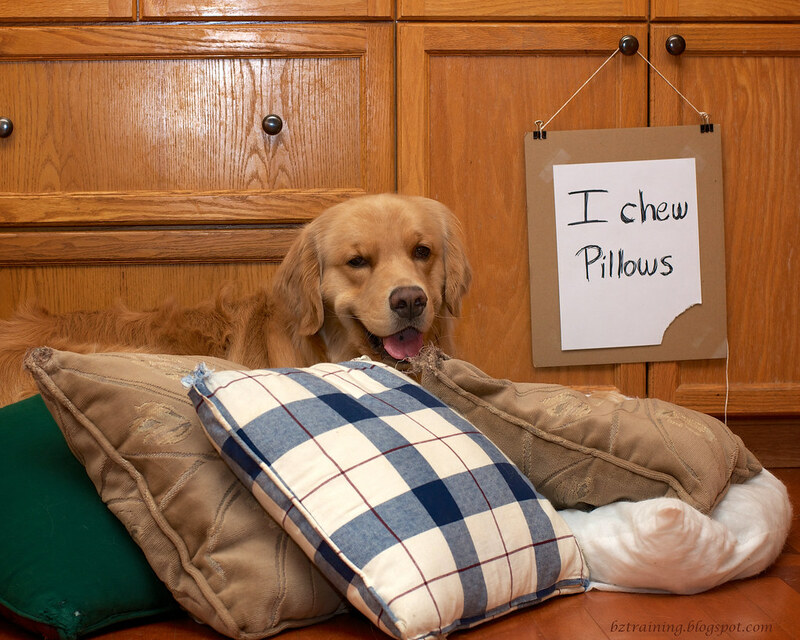 Henry likes to chew on pillows. In fact, this is a just a few of his victims - the few I haven't gotten around to throwing away. No Henry, that's not what Momma has in mind when she gets a new Throw Pillow. 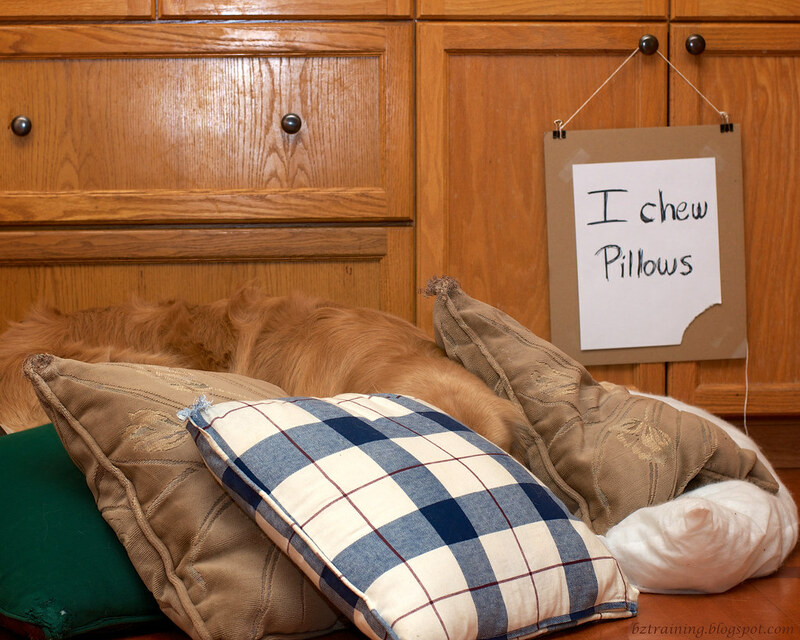 Pile of pillows, a sign, a door, and Henry. There were none of the former, requiring none of the latter. Henry was a Gumby dog, staying in any position I put him into. I folded paws over pillows, under pillows, had him turn his head one way and look another. He was a first rate model tonight, and was paid handsomely for it. As the Precious Puppy pleased me so much with his portraits, Mr. Perfect didn't have to fess up to anything at all. He still got the treats, of course. He played 30-treat-pick-up in the Living Room while I picked up pillows. BTW: If you ever wondered what's behind the black stretchy velvet backdrop, here's your answer. And the knob with the sign on it? That's one I slip the rubber band over when I set up the set (as illustrated at the bottom of my Wild Things post a while back). The other one is equidistant to the left from the center of the two left knobs. Editor's Note: On the bright side, it does give me ample opportunities to redecorate. I'm sure the Precious Puppy thinks he's doing me a favor. 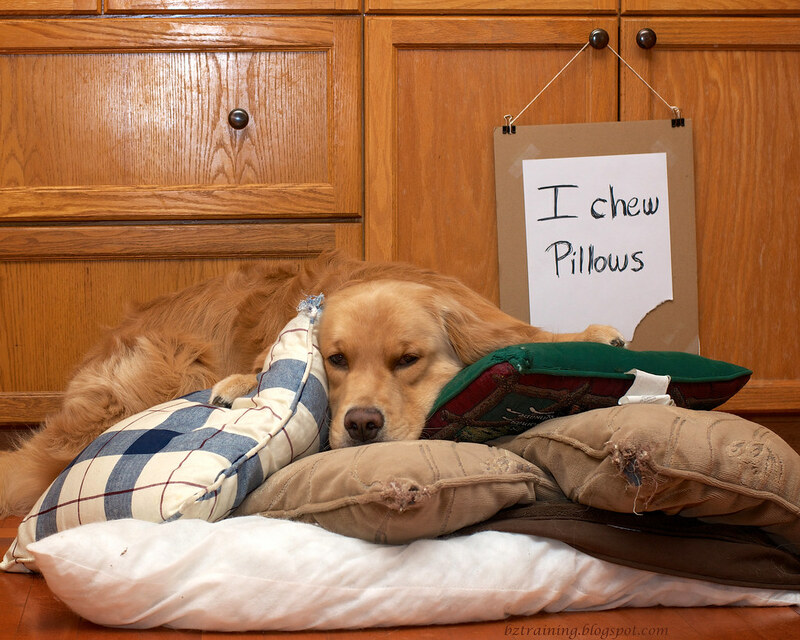 oh Henry..the wall of shame?..it's okay little buddy..Tucker has a pillow fetish too! !..you are in good company!! I'm still laughing! That "Maybe..." shot just melted me! I love that he also took a bite out of the sign. Oh, this was such a great set up! I love what you did with it! This is one of my favorites from your posts! I giggled so hard. Such a sweet dear puppy, and you did an amazing job of capturing his expressions. My golden was next to perfect as well...his thing wasn't pillows, but pizza. Anything else, even left on eye level, was never touched. Pizza? All bets were off. I never had the heart to scold him, though I tried very VERY hard to keep him from getting any because of his wheat allergies! LOVE this post! 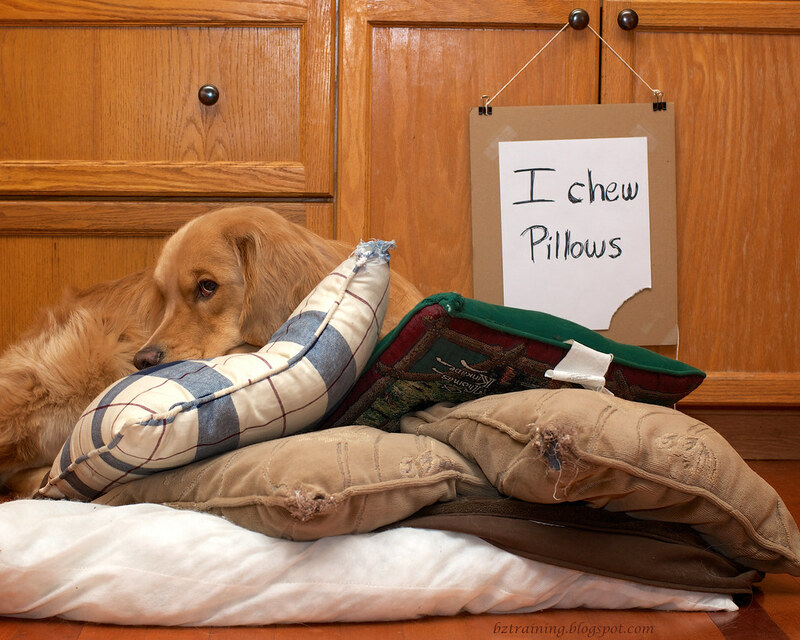 I don't chew pillows but maybe I should try them out. I only chew stuffies. Do they taste good?